Last week, I spoke about otaku culture (the topic of my PhD dissertation research) on three separate occasions. On Wednesday, I gave a two hour presentation/Q&A session with the Nichibei Exchange, a group of New York City professionals who are all interested in Japanese culture and Japan/US relations. This month, they wanted to hear more about otaku culture, so they called me up and I gave my talk. This group was highly educated and very knowledgeable about Japan, so the discussion went very well. On Thursday night, I spoke on a panel presentation called "Fanatics, Cuties & Geeks: The Otaku Phenomenon & its Impact Abroad" at Japan Society, also in New York City. This time, I spoke very briefly (and quickly), summarizing my thoughts on otaku culture. Other panelists presented as well, and we had a lively Q&A session with the audience members. Finally, on Saturday afternoon, I moderated a panel discussion at Japan Society entitled "Why is Anime So Cool? Otaku in America". About 40 teenagers attended, and after some opening presentations by the panelists, we opened it up to the teens to talk about their experiences and feelings about anime and being anime fans. I was very impressed not only by the passion the kids had for anime, but by their depth of knowledge and their committment to learn more about the medium they love. All this week, I've been in Oslo, Norway visiting the browser company Opera Software. I've been having a great time meeting various Opera employees and getting a better sense of what the company is all about. I liked the company (and their browser product) before, but after this week, I like them even more. Oslo is really pretty, as well. Other than a weeklong honeymoon in England, I've never been to Europe, so Oslo feels very different to me (in a good way). A few weeks ago, I came across a documentary short called "Hikikomori" that came out this year and played at a couple of film festivals. 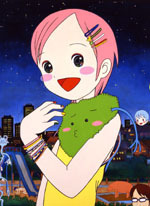 The creators of "Hikikomori" put the full movie online with translations in multiple languages. For those of you unfamiliar with the hikikomori phenomemon as it has been observed in Japan, it is a form of acute social withdrawal where people pull themselves out of society and severely limit their social interaction. 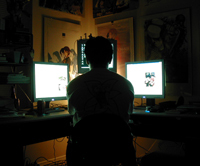 Many hikikomori fill their time with manga, anime, and video games. Although I consider hikikomori and otaku as being very different from each other, they do share some similarities (such as the types of media that tend to interest them). As such, some people conflate otaku and hikikomori. The documentary consists mostly of interview footage with hikikomori and otaku in Japan, and people talking about them. It's not an exhaustive study by any means. Instead, it's an interesting and quick look at one sector of Japan's subcultural landscape. For more on hikikomori, you can read a short article I wrote in 2001 and Michael Dziesinski's excellent blog, Japan's Lost Generation.